Download NCERT Solutions for CBSE Class 11 Biology The Living World What is living? Biodiversity; Need for classification; three domains of life; taxonomy and systematics; concept of species and taxonomical hierarchy; binomial nomenclature; tools for study of taxonomy-museums, zoological parks, herbaria, botanical gardens. Download NCERT Solutions for CBSE Class 11 Biology Biological Classification Five kingdom classification; Salient features and classification of Monera, Protista and Fungi into major groups: Lichens, Viruses and Viroids. Download NCERT Solutions for CBSE Class 11 Biology Plant Kingdom Salient features and classification of plants into major groups - Algae, Bryophyta, Pteridophyta, Gymnospermae and Angiospermae (three to five salient and distinguishing features and at least two examples of each category); Angiosperms - classification upto class, characteristic features and examples. Download NCERT Solutions for CBSE Class 11 Biology Morphology of Flowering Plants Morphology and modifications: Tissues. Morphology is the branch of biological science that deals with the study of form, size, colour, structure and relative position of various parts of organisms. Download NCERT Solutions for CBSE Class 11 Biology Anatomy of Flowering Plants Anatomy and functions of different parts of flowering plants: root, stem, leaf, inflorescence, flower, fruit and seed (to be dealt along with the relevant experiment of the Practical Syllabus). Download NCERT Solutions for CBSE Class 11 Biology Cell The Unit of Life Cell theory and cell as the basic unit of life: Structure of prokaryotic and eukaryotic cells; Plant cell and animal cell; cell envelope; cell membrane, cell wall; cell organelles - structure and function; endomembrane system, endoplasmic reticulum, Golgi bodies, lysosomes, vacuoles; mitochondria, ribosomes, plastids, microbodies; cytoskeleton, cilia, flagella, centrioles (ultrastructure and function); nucleus, nuclear membrane, chromatin, nucleolus. Download NCERT Solutions for CBSE Class 11 Biology Biomolecules Chemical constituents of living cells: biomolecules, structure and function of proteins, carbohydrates, lipids, nucleic acids, enzymes, types, properties, enzyme action. Download NCERT Solutions for CBSE Class 11 Biology Cell Cycle and Cell Division Cell cycle, mitosis, meiosis and their significance. The sequence of events by which a cell duplicates its genome, synthesizes the other constituents of cells and eventually divides into two daughter cells is called cell cycle. Download NCERT Solutions for CBSE Class 11 Biology Transport in Plants Movement of water, gases and nutrients; cell to cell transport, Diffusion, facilitated diffusion, active transport; plant-water relations, Imbibition, water potential, osmosis, plasmolysis; long distance transport of water - Absorption, apoplast, symplast, transpiration pull, root pressure and guttation; transpiration, opening and closing of stomata; Uptake and translocation of mineral nutrients - Transport of food, phloem transport, massflow hypothesis; diffusion of gases. Download NCERT Solutions for CBSE Class 11 Biology Mineral Nutrition Essential minerals, macro- and micronutrients and their role; deficiency symptoms; mineral toxicity; elementary idea of hydroponics as a method to study mineral nutrition; nitrogen metabolism, nitrogen cycle, biological nitrogen fixation. Download NCERT Solutions for CBSE Class 11 Biology Photosynthesis in Higher Plants Photosynthesis as a mean of autotrophic nutrition; site of photosynthesis, pigments involved in photosynthesis (elementary idea); photochemical and biosynthetic phases of photosynthesis; cyclic and non cyclic photophosphorylation; chemiosmotic hypothesis; photorespiration; C3 and C4 pathways; factors affecting photosynthesis. Download NCERT Solutions for CBSE Class 11 Biology Respiration in Plants Exchange of gases; cellular respiration - glycolysis, fermentation (anaerobic), TCA cycle and electron transport system (aerobic); energy relations - number of ATP molecules generated; amphibolic pathways; respiratory quotient. Download NCERT Solutions for CBSE Class 11 Biology Plant Growth and Development Seed germination; phases of plant growth and plant growth rate; conditions of growth; differentiation, dedifferentiation and redifferentiation; sequence of developmental processes in a plant cell; growth regulators - auxin, gibberellin, cytokinin, ethylene, ABA; seed dormancy; vernalisation; photoperiodism. Download NCERT Solutions for CBSE Class 11 Biology Digestion and Absorption Alimentary canal and digestive glands, role of digestive enzymes and gastrointestinal hormones; Peristalsis, digestion, absorption and assimilation of proteins, carbohydrates and fats; calorific values of proteins, carbohydrates and fats; egestion; nutritional and digestive disorders - PEM, indigestion, constipation, vomiting, jaundice, diarrhoea. Download NCERT Solutions for CBSE Class 11 Biology Breathing and Exchange of Gases Respiratory organs in animals (recall only); Respiratory system in humans; mechanism of breathing and its regulation in humans - exchange of gases, transport of gases and regulation of respiration, respiratory volume; disorders related to respiration - asthma, emphysema, occupational respiratory disorders. Download NCERT Solutions for CBSE Class 11 Biology Body Fluids and Circulation Composition of blood, blood groups, coagulation of blood; composition of lymph and its function; human circulatory system - Structure of human heart and blood vessels; cardiac cycle, cardiac output, ECG; double circulation; regulation of cardiac activity; disorders of circulatory system - hypertension, coronary artery disease, angina pectoris, heart failure. Download NCERT Solutions for CBSE Class 11 Biology Excretory Products and their Elimination Modes of excretion - ammonotelism, ureotelism, uricotelism; human excretory system - structure and function; urine formation, osmoregulation; regulation of kidney function - renin - angiotensin, atrial natriuretic factor, ADH and diabetes insipidus; role of other organs in excretion; disorders - uraemia, renal failure, renal calculi, nephritis; dialysis and artificial kidney. Download NCERT Solutions for CBSE Class 11 Biology Locomotion and Movement Types of movement - ciliary, flagellar, muscular; skeletal muscle- contractile proteins and muscle contraction; skeletal system and its functions; joints; disorders of muscular and skeletal system - myasthenia gravis, tetany, muscular dystrophy, arthritis, osteoporosis, gout. Download NCERT Solutions for CBSE Class 11 Biology Neural Control and Coordination Neuron and nerves; Nervous system in humans - central nervous system; peripheral nervous system and visceral nervous system; generation and conduction of nerve impulse; reflex action; sensory perception; sense organs; elementary structure and functions of eye and ear. Download NCERT Solutions for CBSE Class 11 Biology Chemical Coordination and Integration Endocrine glands and hormones; human endocrine system - hypothalamus, pituitary, pineal, thyroid, parathyroid, adrenal, pancreas, gonads; mechanism of hormone action (elementary idea); role of hormones as messengers and regulators, hypo - and hyperactivity and related disorders; dwarfism, acromegaly, cretinism, goiter, exophthalmic goiter, diabetes, Addison's disease. NCERT 11th class Biology book solutions are available in PDF format for free download. These ncert book chapter wise questions and answers are very helpful for CBSE board exam. CBSE recommends NCERT books and most of the questions in CBSE exam are asked from NCERT text books. Class 11 Biology chapter wise NCERT solution for Biology part 1 and Biology part 2 for all the chapters can be downloaded from our website and myCBSEguide mobile app for free. CBSE class 11th Biology have one books. Book has chapters and topics. Here is the list of topics covered under each chapter of class 11 Biology NCERT text book. 8.1 What is a Cell? 9.1 How to Analyse Chemical Composition? 13.1 What do we Know? 13.3 Where does Photosynthesis take place? 13.4 How many Pigments are involved in Photosynthesis? 13.5 What is Light Reaction? 13.7 Where are the ATP and NADPH Used? NCERT Solutions Class 11 Biology PDF (Download) Free from myCBSEguide app and myCBSEguide website. 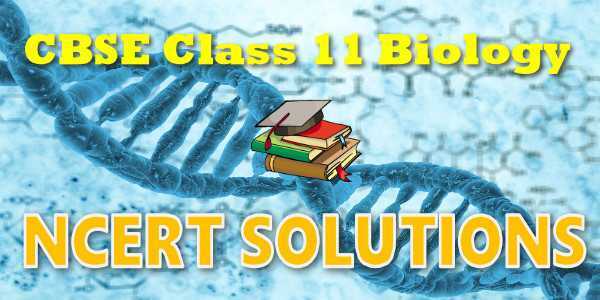 Ncert solution class 11 Biology includes text book solutions. NCERT Solutions for CBSE Class 11 Biology have total 22 chapters. Class 11 Biology ncert Solutions in pdf for free Download are given in this website. Ncert Biology class 11 solutions PDF and Biology ncert class 11 PDF solutions with latest modifications and as per the latest CBSE syllabus are only available in myCBSEguide.